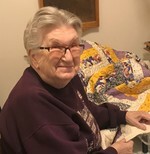 January 27, 2019, age 83 of Inver Grove Heights Formerly of South St. Paul. Preceded in death by husband Gordon and 8 siblings. She is survived by 5 children Gordy, Glen (Trina), Garth, Carolyn (Doug) Willenbring and Garen; 15 grandchildren; 11 great-grandchildren & 1 great-great-grandchild and brother Butch (Peg) Nielsen and other relatives and friends. Family will greet friends 1:00 p.m. to 3:00 p.m. Saturday, February 2, 2019 at KANDT & TETRICK FUNERAL HOME 140 8th Ave No. South St. Paul. Memorial Service 3:00 p.m. Saturday.